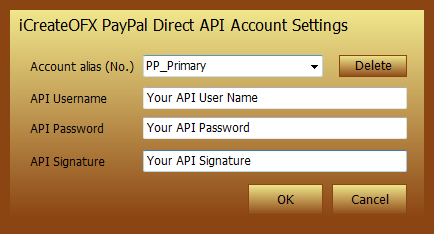 iCreateOFX PayPal Direct OFX and QIF Converter - PayPal OFX and QIF Converter - Convert PayPal transactions to OFX and QIF files. 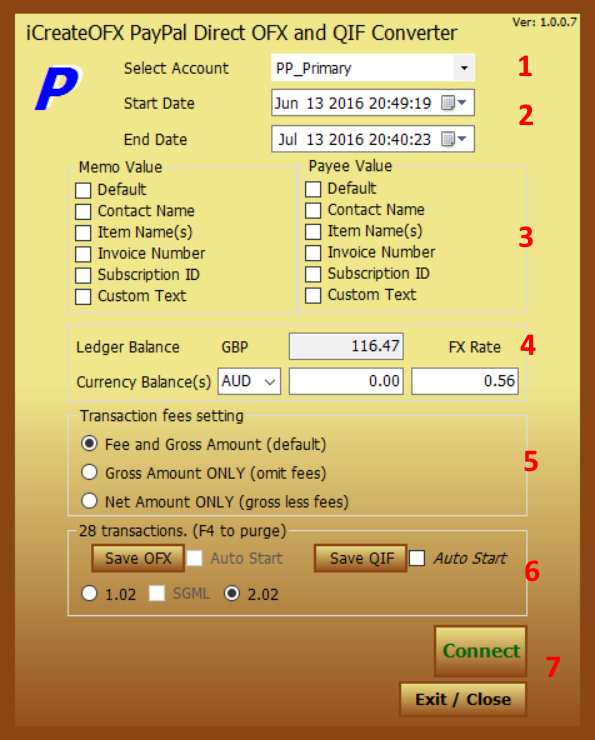 Convert PayPal Premier transactions to OFX and QIF files. Convert PayPal Business transactions to OFX and QIF files. This script is also available in iCreateOFX Basic during the 30 day trial and for business licensees thereafter. The Account: This is the PayPal account you wish to download transactions for. You can have multiple accounts setup via the Account Settings dialog (see secondary image). Account Alias: Select an alias to associate with the account. The alias will be used as the account number in the resultant OFX and QIF files. Start and End Dates: Select the timespan for which you want to download transactions for. By default, the start date will be set to 30 days from the date when the program is started. All transactions will be automatically archived for that date range, however, if the same date range is selected again, all transactions available at PayPal will be re-downloaded. The Memo and Payee Values: These are the details that are included in the QIF and OFX files for the Memo and Payee fields. The Default option is recommended, however, if you require additional / other values, selecting these will ensure they are included. NOTE: for OFX files, the Payee field is limited to 32 characters and thus if you select a value that exceeds this length, it will be truncated. The Ledger Balance: This represents the total balance in the PayPal account's primary currency. Currency Balances: If you hold multiple currencies in your PayPal account, these will be listed here in addition to the PayPal FX rate to your primary balance. NOTE: The FX rates are as supplied by PayPal, however, they are merely an estimation of the balance transfer rate and lack precision. You can adjust the rates if your ledger balance is not accurate. Transaction fees setting: Select an option from here to determine the treatment of PayPal fee(s) in the OFX and QIF file. the first option will include the fee(s) as a separate transaction, the second option will NOT include any fee(s), while the last option will deduct the fees from the transaction amount. Save OFX and Save QIF: This is the area to save your files from. If your computer has a file association to either file format, then selecting the Auto Start option next to the respective button before saving will invoke the associated program once the file has been written. If the Auto Start option is not enabled, then the program could not find any associated program to the respective file type. Connect: This will connect to PayPal to retrieve the transactions between the date ranges set in the start and end date(s).